When I heard All the Bright Places by Jennifer Niven was supposed to be a cross between Thirteen Reasons Why and Eleanor and Park, I felt extreme trepidation, but also excitement. Both of those books are two of my favorites so I knew I HAD to read this. Once I did, it felt like stepping out of the shadows into the bright light of life where I found the beauty and the heartbreak of this oh so lovely book. I spent an entire day consumed by the lives of Theodore Finch and Violet (Ultraviolet Remarkey-able) Markey. What I discovered upon reaching the end, was a story I would never forget. This book was exquisite and filled with all the magic and meaning life has to offer. The dual points of view captured the essence of humanity, creating equal empathy for both characters within the book. Violet and Finch seemed completely perfect in their imperfections and I was willing to wander and journey with them. Much like Rainbow Rowell, Niven populated her world with characters that felt like real people. In this contemporary young adult story, real is just what I craved from the characters. Finch and Violet are flawed and broken. But who isn't? I think some of the best people I've ever known have been broken. I know I used to one of those people. Sometimes I feel that shattered girl from high school deep inside and it makes me sad to think about what might have happened if books hadn't saved her. In high school, I was bookish and shy and too afraid to share my stories with anyone, let alone my peers. I fell out of a group of friends my sophomore year of high school and spent the next two trying to find my place in a world that didn't care much either way. It was painful. I'm not going to sugar coat it because that's not what Jennifer Niven does in her book. She has the courage to share the darkness that sometimes seeps into our lives. She does this by extracting unsettling moments and sharing them with the reader. Through devouring this book and remembering my own young adult self, I discovered the power of forward motion. All the Bright Places is propelled by the forward motion of the characters, even when they feel stuck. And I think moving forward is sometimes the best thing we can hope for. I believe in the power of moving onward and as evidenced by this book, I believe Jennifer Niven does too. For those of you who haven’t yet read this book, I think Jennifer Niven would want me to tell all of you that it gets better, that someone loves you, and that someone is thinking about you. But most of all, I think she’d want me to tell you about the importance of books and stories and what can happen when we share them with others. I'm serious when I say books saved me. Books were my Theodore Finch. I'm so happy that this book exists and that someone out there might find this and decide that the shadows of life are only temporary. That somewhere there is light and that someday they will find their own bright place. There were so many amazing words of wisdom throughout this book. It would be difficult to quote them all here. And I'm not sure the lines that I loved would feel the same to you. Maybe you need to read this book for yourself to find the words that might change you. Because that's what this book did for me. It changed me. It helped me believe in books again. It helped me find that sad, broken girl from high school and share her story with you. 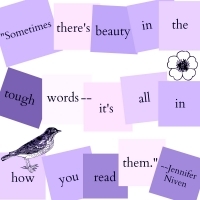 I hope you'll take the time to read Jennifer Niven's book and to share your story with someone else. It just might be the thing that saves them. P.S. Check out Germ Magazine, a space inspired by All the Bright Places, a place for you to start!